Whether you are an experienced practitioner or a recent graduate, staring your own law firm can present some of the biggest challenges that you will face throughout your legal career. In addition to founding a new business and attracting customers there is the challenge of practising the law in your chosen area of expertise on your own. Being able to foresee, understand and prepare for these issues will help your firm succeed and remain agile in a highly competitive market. 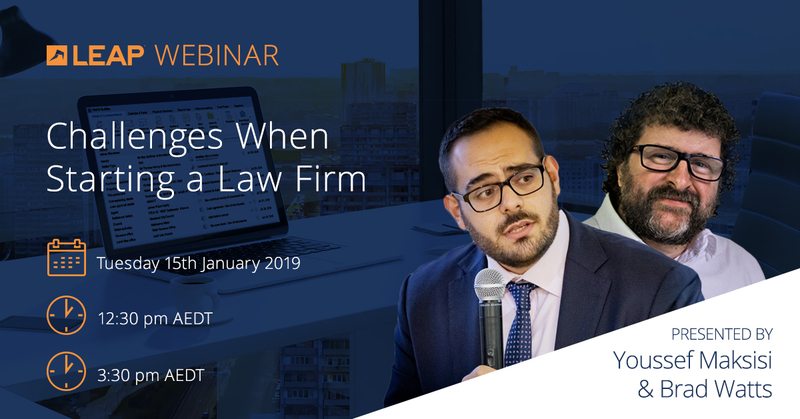 Join a free webinar session hosted by LEAP and hear from two experienced lawyers and expert panellists from LEAP’s 2018 Start A Law Firm event who have both founded industry leading law firms. Admitted as a NSW solicitor in 1994, Brad has more than 20 years experience in legal practice, including as a partner, director and consultant. Brad was a contributing author for 10 years, before joining By Lawyers full time in January 2018 as the Managing Director. Brad brings a wealth of knowledge and an empathetic, hands-on approach to the business of helping small law firms get real time access to the best possible legal content via the By Lawyers legal guides and precedents. Youssef Maksisi has worked both in the heart of Sydney’s legal community (Sydney CBD) as well as a boutique firm in Parramatta. He has successfully represented clients, whether corporations or individuals, in a range of legal areas, achieving excellent results. Youssef uses these experiences to ensure his firm, Maksisi Lawyers, provides high-level CBD-style expertise with the personal connection of a boutique firm. Register for the webinar here and claim CPD points for attendance.